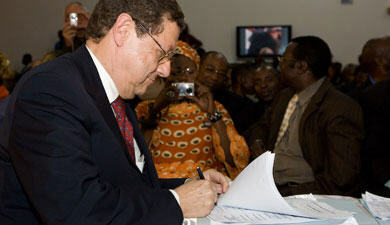 Goma, January 23, 2008: MONUC, the United Nations mission in the Democratic Republic of Congo (DRC), welcomes the success of the Kivus conference on peace, security and development. One of the first concrete results is the signature of the "acts of engagement" of Goma which mark the beginning of a process intended to durably restore peace and security in the provinces of North and South Kivu in eastern DRC. MONUC congratulates all the conference participants, in particular President Joseph Kabila who initiated it, as well as Fr. Malu Malu, president of the office of the conference and Mr. Kamerhe, president of the committee of the wise, who through their total engagement contributed largely to this success. MONUC also congratulates all the armed groups and the various communities who put aside their differences in the interests of peace and reconciliation in the Kivus. Mr. Alan Doss, Special Representative of the UN Secretary General in the DRC and head of MONUC, gave a short speech at the end of the conference. "This is a very important day for the Congo. The full and total implementation of the commitments entered into here in Goma means that the people of the Kivus, especially the women and children, can envisage a much better future, free of any violence. We all must work very hard in order to make sure that will be concretised." The act of engagement process in Goma comes from what was initiated by the joint Nairobi agreement of 9 November 2007, and constitutes a crucial step in long term efforts to restore a durable peace in the Great Lakes region. Conscious of the big role reserved for MONUC by the acts of engagement for peace in Goma, MONUC is mobilising in order to quickly reinforce its military and civilian presence in the Kivus, in order to support the immediate disengagement of the armed groups, as well as the stabilisation efforts to ensure the security of the population in the Kivus.